1962 Ferrari 250 GT SWB California Spyder sold for: $8,580,000. Photo: shooterz.biz © Courtesy of RM Auctions. MONTEREY, CA.- RM Auctions, the worlds largest collector car auction house for investment-quality automobiles, continued its strong track record for historic Ferraris in Monterey, California last night (August 18) with a 1962 Ferrari 250 GT SWB California Spyder achieving a remarkable $8,580,000 and a 1956 Ferrari 250 GT LWB Berlinetta Tour de France realizing a strong $6,710,000 before a packed house. 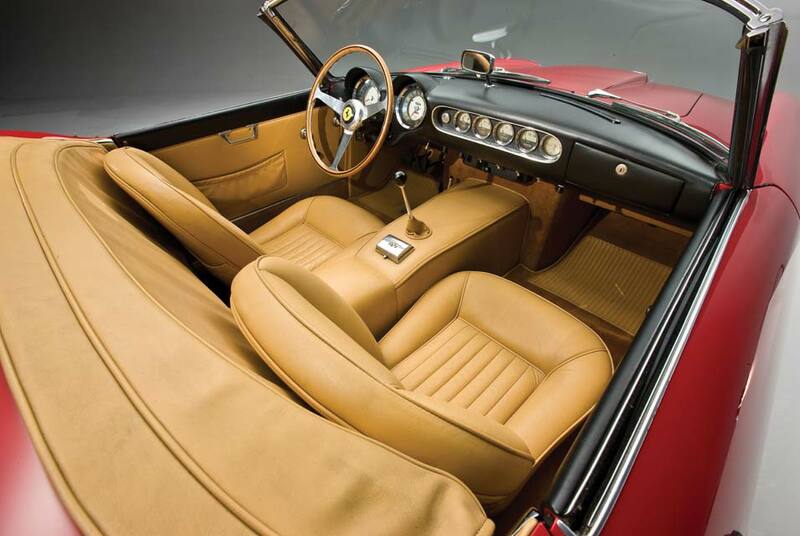 Considered one of the most beautiful and desirable Ferraris in existence, the short wheelbase California Spyder, chassis 3119 GT, is one of only 37 short wheelbase variants in the highly desirable covered headlight configuration. Resplendent in Rosso Corsa over a tan leather interior, the exclusive, Ferrari Classiche certified example sparkled under the auction lights, attracting spirited bidding before selling to a collector on the phone. Another great example from the famed Italian marque handpicked for the sale, the fourteen-louver 1956 Ferrari 250 GT LWB Berlinetta Tour de France, chassis, 0585 GT, also spurred a lively bidding contest in the room and on the phones before being won by a collector onsite. The sale-topping pair led an impressive group of five historic Ferraris achieving million-dollar-plus results during RMs Saturday sale session. In total, 13 automobiles exceeded $1 million each during the three-and-a-half hour sale, with a number of new world records set. The Saturday sale session concluded RMs 2012 Monterey auction. In total, the two-day sale presented approximately 120 blue-chip automobiles as part of the most significant auction offering ever presented on the Monterey Peninsula.